Wishing you a happy Friday sounds so out of place right now, doesn't it? So I've decided to wish you a peaceful weekend. I've been working a lot offline lately so excuse me for being a bit distracted from my blog this week but I'm happy to be here today, just briefly at least, before the weekend begins. How are you doing? Are you well? I've been counting my blessings a lot this week, particularly when I watch the news because my heart aches for Japan but also for those affected globally by this tragedy - particularly ones with family in Japan like dear Leslie -- my friend and Color Me Pretty columnist. Leslie is half Japanese, her mother is from Japan, so they have family living there and visit frequently. In fact, Leslie travels over at least once a year so her connections there are strong. If you have time today, please visit Leslie's blog and leave her a message of hope + peace if you can. She's had a tough week absorbing all of this as you can imagine and what a sweetheart... she still found time to push through her feelings and work on a gorgeous color story for you that I'll run on Monday morning that will be so uplifting to see. I've had a glimpse and it's gorgeous. And are you holding up okay? I've felt a little uncomfortable writing on decor8 this week -- it's hard to get excited about furniture and decorating when people are suffering and that won't end soon because then, a massive rebuilding will have to occur in certain places and that can take years to complete. This will be a long journey for Japan and my heart breaks for such a dear culture. It's hard to rah rah about products and pretty things and "home" in general when for some, their home has been carried out to sea or is abandoned with belongings spread for blocks - belongings that may not be reunited with their owners ever again. 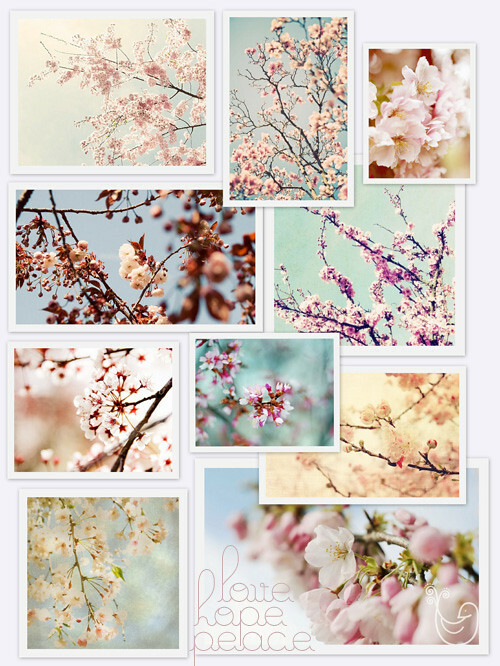 I put together some gorgeous photographs taken of cherry blossoms for you today, most are from various etsy sellers and they made me feel very peaceful to look upon them. Cherry blossoms (Sakura) are indigenous to Japan with over 200 cultivars found there. Whenever I see them, I think of Japan. In Japanese culture, cherry blossoms can symbolize clouds but are also a metaphor for the ephemeral nature of life and the concept of mono no aware. Do you know much about mono no aware? If not, this is quite a fascinating read if you have a moment, click here. It is the belief that, "Awareness of the transience of all things heightens appreciation of their beauty, and evokes a gentle sadness at their passing." Cherry blossoms also symbolize affection, love, and represent spring. The images above can be found and most of them purchased here in the shops of some of my favorite etsy sellers: shaded memories, fly with me, thorsten becker, green zinnia studio, amanda raek, shaded memories, becca c fowler, born barefoot and humboldt street. I love each of their photos, they give me a feeling of peace and joy just to behold them. I'll be back with some positive thoughts and posts next week but for now I'd like to encourage you to stay positive, donate to a reputable charity or help where you can, and spread love, peace, be supportive of one another and care about those around you. Do what you can to go out of your way to show love. I'm learning more and more from my dear friend Laurie, an American living nearby, about "mindfulness" or being present -- really "in" the moment... Just recently we were at a cafe and she explained that being mindful means to hug your friend and really smell her perfume, taste the coffee as you sip it, enjoy the texture as you chew a freshly baked brownie, to notice the sights and sounds around you and to be present and to allow this presence to give you energy, peace, balance, joy and to help you to appreciate life's details. It's a gift to learn this and we can practice it more and more until it becomes second nature. Being mindful can do so much to make us appreciate every little thing in our life and to drink in every moment -- and this can help us through some very hard times. The Japanese people are very mindful as a culture, and at ease, and they strive for balance and I think that this is why they still remain so calm despite this tragedy. There is so much to learn from others who are often much stronger than we are. To wrap up the week, perhaps we can approach spring (which falls on March 20th this year) with a fresh outlook -- to practice being more aware, to be mindful and to enjoy what we have. Really enjoy the magazine that you plan to look through for inspiration. Feel the warmth of your kitty at your feet, purring loudly. Hear the sound of the clock ticking on the wall. Take in the sights and sounds around you as you commute home on the train. Connect. Be aware. We are alive, so many of us have peace, and abundance in our life -- let us be mindful of that fact and appreciate it and to then take what we have and share it with others. I wish you a peaceful, mindful weekend - be grateful for everything... And I'll see you dear friends again on Monday for a fresh beginning as we welcome the good things that Spring can bring, together. Decorate Book Launch at Liberty in London: April 13th!